Snow In Lincolnshire is quite unusual; at least the heavy sort is. The weather here is balmy, maybe a little more windy on the East Coast, but usually we avoid snow or just manage a sprinkling at odd times and it quickly melts away. The photos in this article therefore are pretty unusual for the Lincoln area and signs of a very hard winter all over Britain. Well, does Lincolnshire get much snow in winter? Up to two years ago I would have said "No! Very little snow" Lincolnshire has quite a mild climate and snow is rare here. The last couple of years Lincolnshire has had a lot of snow. Being stranded by snow at this time gave me a wonderful opportunity for photography. Here are some pictures of Lincolnshire in the snow. Photos in this lens are all my own work unless otherwise stated. please do not copy! Lincolnshire - a most temperate county! Lincolnshire is not a place that is used to extremes of weather. When the rest of the country shivers under snow, we often escape the worst or get it later in smaller doses. In this week where the headlines are concerned with "winter travel misery" or "misery in the snow" all I want to do is show a lighter side by sharing some of my photos with you. Every cloud they say has its silver lining. A birdbath is a way you can help wildlife all year round. When the water is frozen, the birds will visit to use your birdbath. A Terrible Mistake For Wildlife! 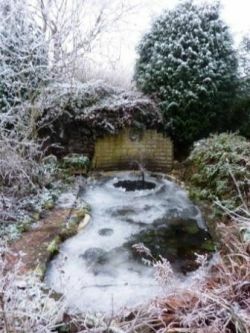 When the ponds freeze we worry about build up of toxic gases killing fish and frogs. Birds have no drinking or bathing water either. However, the very worst thing you can do of course is to break the ice. This creates a shock wave which disturbs and can kill wildlife. 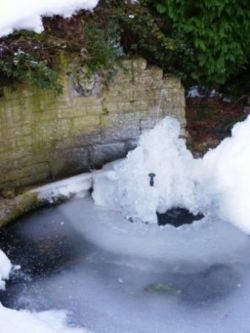 It is best to fill a pan with hot water and place it on the ice in several places to make holes that allow gases to escape and birds to drink. This picture shows holes that have refrozen and also an area of thin ice where holes had been created and refilling created a larger area of open water. 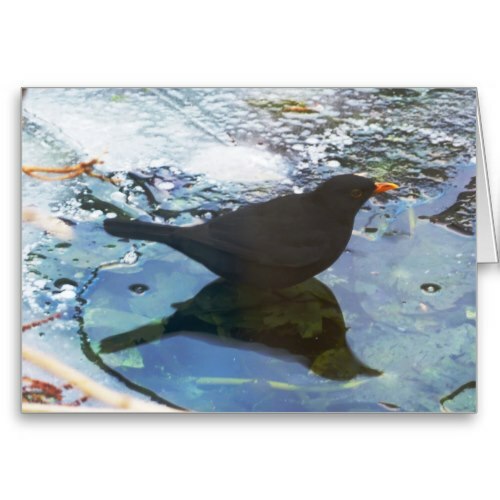 The zazzle images were taken of birds enjoying holes I made with the hot pan technique. My first point is, however well prepared you may be, travel on snow and ice is always going to be difficult. There will always be those who think that a 60mph limit is always 60mph! A good driver knows that a speed limit is a maximum in GOOD conditions. In poor visibility or icy driving conditions 30mph can be dangerous. In heavy snow where it is untreated and compressed, traction can be lost at any speed and cars spin off or become stranded. Where snow is a usual feature of winter, you can buy snow tires. It is worth carrying some winter equipment with you. This should include snow shovel, blankets and extra clothing, cellphone, carpets for traction in snow, hot drinks in a flask, sweets or snacks, essential medication and of course de-icer. Keep your de-icer in the house though, because it works better when it is not frozen in a car you cannot enter because of frozen locks and seals. Keep yourself warm with some gentle music from Lincoln! 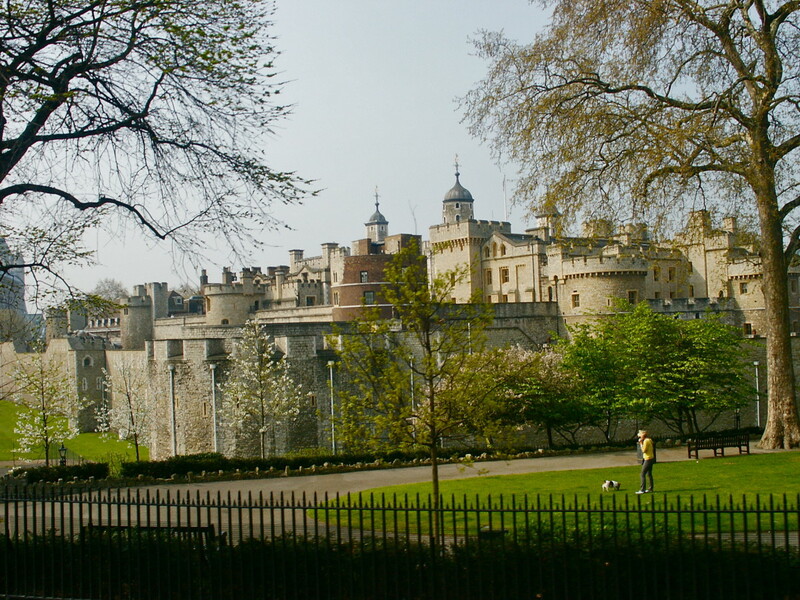 Please let me know or just sign the guestbook - and can I please say thank you for calling in! Did you Enjoy Lincolnshire Under Ice? - Do you Like the Snow? 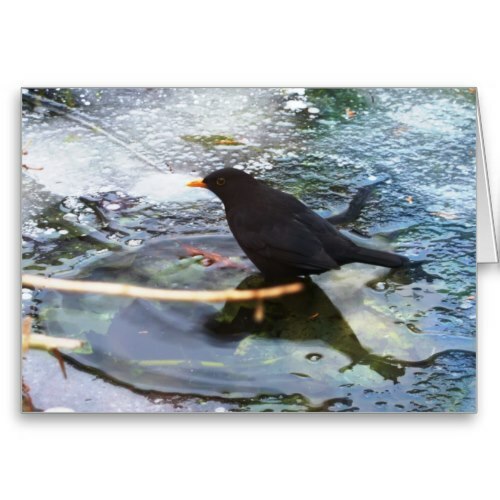 I love the picture of the bird taking a bath. Wow! 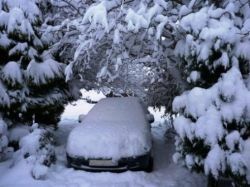 The photos of Lincolnshire were amazing, gave me goose bumps just thinking i was in the snow balled car.Thumbs up!!! Slightly too real for comfort, just when I'm looking forward to the end of winter but lovely nonetheless. Lovely photos! I have to say I really enjoy the beauty of winter - especially when I'm warm inside! 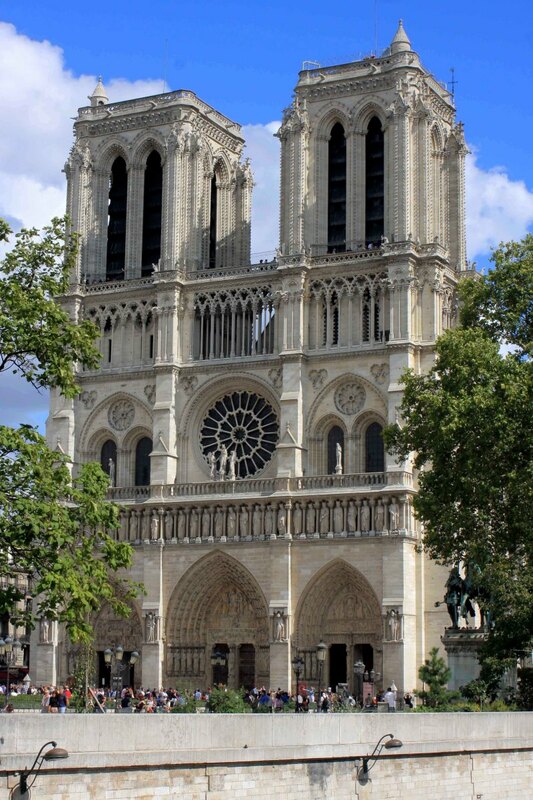 OMG, it was so realistically beautiful and captivating, I threw a shawl around my shoulders. Lovely!